If you've gotten married in the last few years, you drive a blue Tacoma, or you're a human person between the ages of birth and qualifying for the senior citizen discount at Golden Corral and simply love great music...then you probably know the name, Russell Dickerson — or at least you've gotten his songs stuck in your head on more than one occasion. 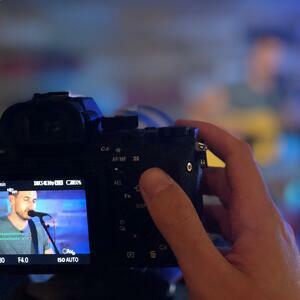 While Russell was in town for a show, he stopped by the MAX office for our monthly music series event, On The Record. I got to sit down and interview Russell before he gave us an exclusive acoustic performance of songs from his latest album, including #1 Billboard charting hit, "Yours." Don't Give Up On Your Dreams, People! I talked with Russell about his record-breaking journey to #1 on Billboard and the song that took him there, his award-winning $6 music video, and what's next for this breaking country music star. But what impressed me most about Russell was his journey to the top — having a #1 hit is impressive on its own, but what inspired me was how he got there. His song "Yours" was released on January 24th, 2014 and didn't reach #1 on Billboard until 4 years later, January 22nd, 2018 — the song broke the record for the longest climb from release to #1 in history. Craig Rector @ MAX: Were there ever moments during those 4 years where you doubted or felt like giving up? 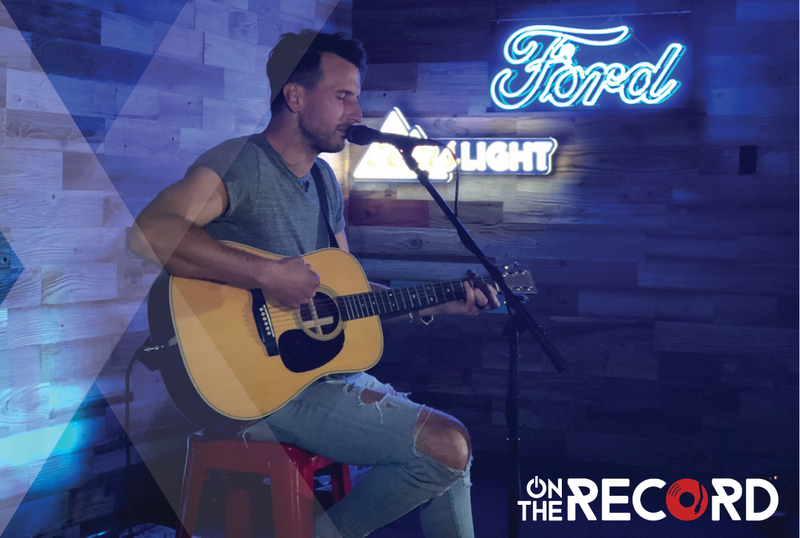 Russell Dickerson: The only moment I was discouraged, was after we did a showcase and every record label in town said no...for the third time — we played "Yours." I remember sitting down with my manager saying, "We're just gonna start our own frickin’ record label then. So we started our own record label, and release 'Yours' under that record label." In 2018, "Yours" hit #1, the second release from the album, "Blue Tacoma" is climbing the charts, Russell Dickerson has been nominated for multiple awards — including CMT's Breakthrough Video of the Year, ACM's New Male Vocalist of the Year, and MusicRow's Breakthrough Artist-Writer — and Russell is now touring with Lady Antebellum and Darius Rucker. In an industry where success is largely controlled by an invitation-only gatekeeper system, Russell broke through on his own terms. Breaking into the music industry is about having a hit song, but long-term success in the music industry is about having a unique sound and style that people recognize and love. Craig Rector @ MAX: What's it like to have country greats [Little Big Town] give you a shout out? 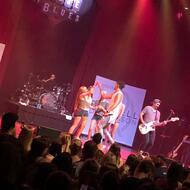 Russell Dickerson: Little Big Town, man, they're huge, and their sound is so cool. When Phillip said, "I love that sound [Russell Dickerson] has created," that's what I welt up with pride for. After On The Record, my wife and I went to Russell's show at the House of Blues in Dallas. The place was packed and the energy was amazing! Russell appeals to such a diverse crowd — I saw the stereotypical button down, boots, and cowboy hat fan, all the way over to the skinny jean, converse, perfectly tousled hair fan. I saw older and younger fans, groups of girls, and even some bro-mancing fans. And his music and performance? 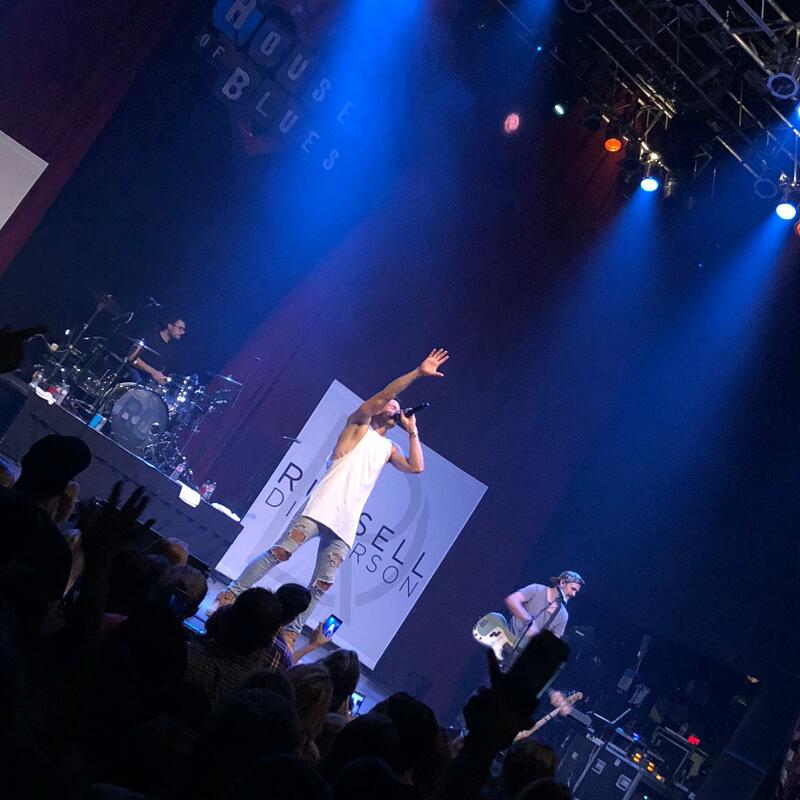 Russell has an unmistakable sound, he's a versatile artist that can crush it on guitar, entertain with just the mic, has a ton of energy on stage and gives the entire audience from left to right, front to back, equal attention and love. All that coupled with an incredible voice, great songs... no matter how deep you go on the album, and a personal life that's as authentic and moving as the songs his fans fall in love with. 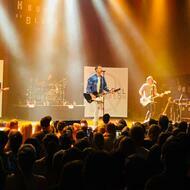 Yeah, this is just the beginning for Russell Dickerson. 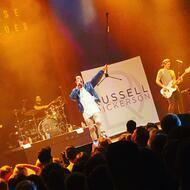 After the interview, Russell played an acoustic version of three songs; "Billionaire,” “Blue Tacoma,” and “Yours." There are so many hit worthy songs on the album, but “Yours” is definitely one of the most romantic songs and – tying it back to the first nine words of this blog post – it was named one of the Hottest Weddings Songs by The Knot. My wife and I got married this year, so having her in the audience at On The Record (watching me interview this artist we love) was even more special. When Russell played “Yours”, we danced in the MAX office as the world faded away around us, and I had an incredibly memorable moment doing what I love with the person I love — #RDfam for life!